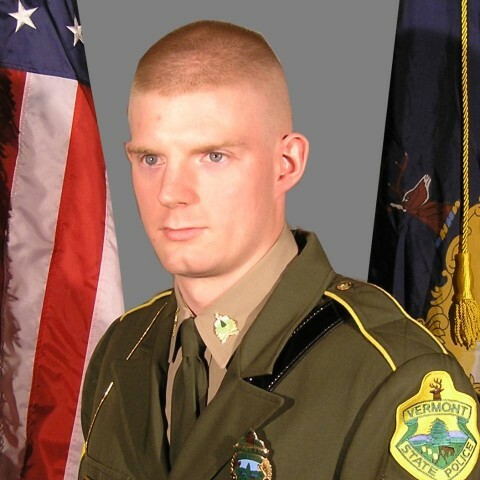 Vermont State Police Corporal Daniel Charles Marcellus passed away peacefully at home on Tuesday, August 15th, surrounded by his family, following a ten-month battle with brain cancer. He was 35. A fourteen-year veteran of the Vermont State Police, Marcellus was hired at age 21 and dedicated his career to working the road as a Trooper for the St. Albans and Williston barracks. In addition to his basic duties, he served as a field training officer, pre-basic instructor, Marijuana Eradication Resource Team member, and crash reconstruction specialist. Known by his peers as selfless and dependable, Marcellus would answer his phone at any hour, dropping everything to respond to a call when his fellow brothers and sisters were in need. While he stood tall and intimidating in uniform, “Trooper Dan” was also known for his kindness, sense of humor, storytelling ability, and genuine desire to make a positive impact in people’s lives. Marcellus also served his country for six years as an Infantryman in the Army National Guard. One of the highlights of his service was a three-month security detail in New York City following the events of 9/11. Always an outdoorsman, Marcellus grew up in the Adirondack Mountains of New York. He spent his free time hiking, camping and skiing. A lifelong New York Giants and Boston Red Sox fan, Marcellus visited Fenway Park every summer with his wife, Jessica. He was honored to throw out the first pitch at Fenway just ten days before his passing. Marcellus is survived by his wife, Jessica, and seven-month-old son, Sawyer; his mother, Bonnie, and step-father, Robert Gosson; sister, Melissa Bartholf, and her three children, Jocelyn, Jenna, and Aidan; grandmother, Dora Harrison; and four step-siblings. Calling hours will be held on Friday, August 18th from 4-7pm at Brady & Levesque Funeral Home, 86 South Main Street, St. Albans. Services will follow on Saturday, August 19th at 12pm at the Collins- Perley Sports Complex. In lieu of flowers, donations can be made to the Jim Bashaw Memorial Cancer and Catastrophic Illness Fund (St. Albans) or the Dana Farber Cancer Institute’s Jimmy Fund. Online condolences and memories may be shared at the funeral home website: www.bradyandlevesque.com. Arrangements are entrusted to the Brady & Levesque Funeral Home and Commemorative Services.